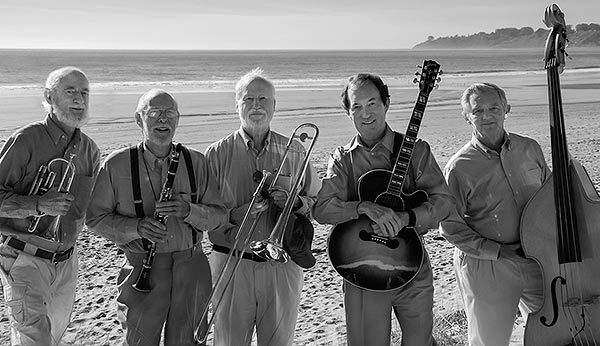 On Jan 31, 2015 the Feetwarmers played for Dee Webers birthday party at a private home facing onto Stinson Beach. Fabulous location! Loads of fun. Hot music. Latest CD Released on Sept. 1, 2012. 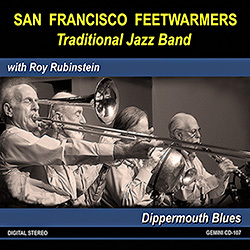 Following the Rossmoor session - see below - the San Francisco Feetwarmers recorded material for their new CD, "Dippermouth Blues" Gemini CD-107, with Mike Cogan as the sound engineer. The CD features Mike Slack and Tom Barnebey on cornets (King Oliver style), guest artist Roy Rubinstein on trombone and Peter Main on reeds. 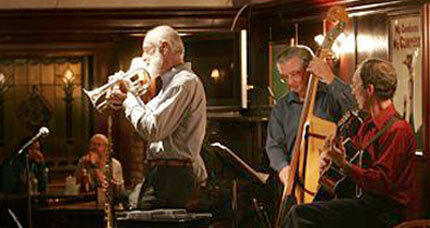 Bill Gould is on piano, Bill DeKuiper on guitar, Tom Clark on bass fiddle, and Hugh O'Donnell on drums. An exceptional masterwork containg All the Girls go Crazy, High Society, Snag It Blues, Muskrat Ramble, Just a Closer Walk, Dippermouth Blues, Speak Softly Love, Buddy's Habits, Lady Love, Some Day Sweetheart, Frog-i-more Rag, Canal St Blues and more. 72 mins of the finest classic jazz. CD's page contains details CD's . Wednesday April 25, 2012, 7:30 to 10:00 PM. 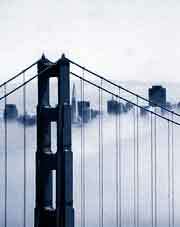 Roy leads Roy Rubinstein's Chicago Hot Six and is well known in the Bay Area for exciting performances with Mike Slack and with the SF Feetwarmers at Sacramento. on Saturday July 23 2011, 7pm - 9pm. A great place to enjoy great wine and tappas plus fabulous music. on Saturday July 17 2010, 11am - 6pm. Picnics on the lawn and fabulous music. at 7:00 pm on Sunday June 14, 2010. The quartet in action .... photo by Kai Shuman. 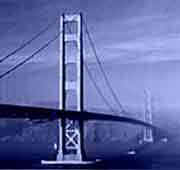 Located at 2120 Allston Way, Berkeley (cross street = Shattuck) and convenient to BART and local Parking. "A day without good trad jazz is like a day without sunshine."